As high-performance computing resources have become increasingly available, new modes of computational processing and experimentation have become possible. The Extreme-scale Model Exploration with Swift (EMEWS) framework enables the direct integration of multi-language model exploration (ME) algorithms while scaling dynamic computational experiments to very large numbers (millions) of models on all major HPC platforms. EMEWS has been designed for any "black box" application code, such as agent-based and microsimulation models or training of machine learning models, that require multiple runs as part of heuristic model explorations. One of the main goals of EMEWS is to democratize the use of large-scale computing resources by making them accessible to more researchers in many more science domains. EMEWS is built on the Swift/T parallel scripting language. Look here for information and tips to reduce the number of dependencies that need to be built by Spack by using already installed software. Once Swift/T is installed, you can install EQ/R and EQ/Py (manually or via Spack) to allow for R-based or Python-based model exploration. 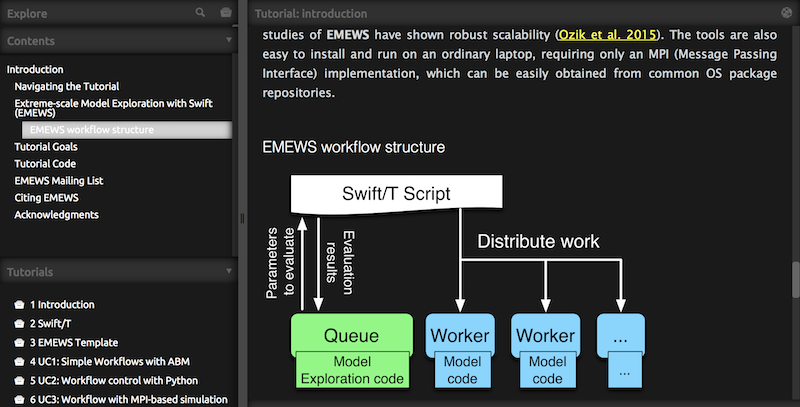 See the EMEWS tutorial (below) for more information. The EMEWS tutorial is the primary resource for using EMEWS. For additional EMEWS resources, see the resources page. For EMEWS papers, see the papers page. For support, including EMEWS mailing list information, see the support page.